Part 1 and Part 2 regarding a phenomenon described by Professor David Wilkins: how a “determined and diverse chorus of individuals, organizations, and even a few Native nations” are saying enough is enough to the wholly non-indigenous practice of disenrollment. Over the first half of this year, the chorus of indigenous voices who denounce disenrollment has grown larger, louder, and stronger. "Disenrollment is a decision to steal from me my own Creator-given DNA, my spark, my own gift. I understand. Because, as an Indian Mother who gave up an Indian Son, it feels eerily reminiscent of a day 39 years ago. He was there. Then taken from my arms. Then gone. I never again had any say. Disenrollment is like a unilateral politically motivated divorce or forced adoption. It is like a relinquishment of parental rights, yet with no due process. Your birthright is there. Then taken. Then gone. Never again do you have any say. 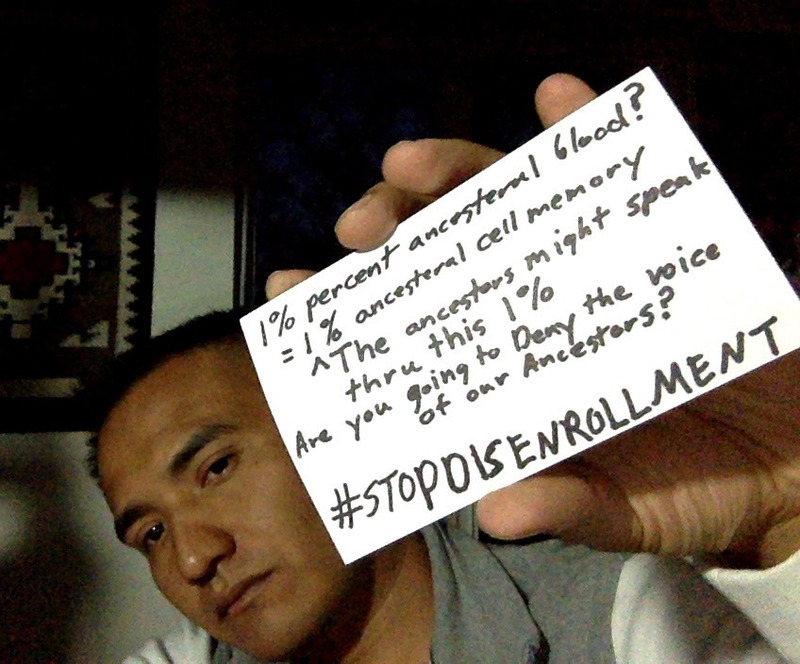 In this way, countless Indians who had not previously spoken out against the colonial practice said their piece; they made clear that we must #StopDisenrollment. As reported by Indian Country Today Media Network, the #StopDisenrollment movement went viral, even spawning a television news story by Al Jazeera, which reported about the epidemic that is disenrollment to the world. As Indian Country increasingly relies upon international indigenous human rights norms to advance tribal self-determination, disenrollment makes us look disingenuous. We cannot reasonably profess to be the oppressed, while being viewed as the oppressor. By March, Global Gaming Business Magazine was also reporting about disenrollment internationally. In a story titled, “Tribal Gaming’s Dirty Little Secret,” author Dave Palermo explained how, since the 1990s, gaming per capita-fueled greed has catalyzed mass disenrollment and, in turn, an identity crisis in Indian Country: "Indian nations historically were inclusive, adopting members—including African-American slaves—and resorting to kidnapping to ensure the sustainability of tribal communities. But disenrollments linked to gambling and per-capita payments are forcing indigenous communities to question what it really means to be an Indian." Mr. Palermo is correct, in exposing our dirtiest secret: that capitalism has overtaken tribalism. Per-capita dollars are the most formidable force in Indian Country today. They now operate like bounties for our own kin. As April arrived, a Northern California tribal lawyer who was facing pressure from the leaders of several Pomo Nations, very publicly resigned from doing disenrollment work on the Elem Indian Colony. Another tribal lawyer in the area faced a public protest at his law offices, given his involvement in several California Indian disenrollment actions and related intra-tribal violence. The Pomo People—meaning Pomo tribal communities not embroiled in disenrollment—took a united stand; tribal leaders leveraged their legal buying power; and good things happened. Any tribal lawyer should think twice about doing disenrollment dirty work. In June, Washington State Senator John McCoy, Tulalip, published his opinions on disenrollment here. He did not mince words: "I oppose disenrollment.... I oppose disenrollment because it undermines an Indian’s—and in fact all of our—heritage and lineage. Disenrollment is ... a federal policy designed to terminate us.... Disenrollment is fueled by greed—pure and simple." “We know better,” he concluded. “We must stop disenrollment.” As a military veteran and respected elder statesman, Senator McCoy’s straightforward message resounds and should cause others in Indian Country’s highest political strata to condemn disenrollment. The “superior” group seeks to control the “inferior” group. Control becomes the operative word; it can mean removal [and] extermination . . . set by parameters typically accompanied by draconian laws [and] cultural control . . . The superior group seeks to provide illusions – a phantom sovereign spirit – onto the inferior . . . Affects of those experiencing disenrollment, the amputation of mind, body and spirit must have an impact on the soul. No longer included in the society they knew, removed by force, legal standing diminished, terminated from their intrinsic setting, there must be [traumatic] effect. Disenrollment has been aptly been described as the taking of an Indian’s “everything.” Samuelson v. Little River Band of Ottawa Indians-Enrollment Comm’n, 2007 WL 6900788, at *2 (Little River Ct. App. June 24, 2007). Accordingly, we must expect disenrollment to have traumatic effects and tragic consequences. With each new powerful voice and refrain, the immorality of disenrollment is made plain. Still missing from the chorus are the federal Trustee, who owes Indian Country a moral trust responsibility to do something about disenrollment; and national inter-tribal and Indian legal defense organizations, who must, as Professor Wilkins implores, also “step forward with swift, decisive actions” to help end disenrollment. Until they do, the malignant disease that is disenrollment will only grow. Thankfully, so too will the size and sounds of the anti-disenrollment chorus. 1. Complete the sentence. Boldly write on your palm or on a piece of paper what disenrollment means to you. 2. Take a picture and post it. Submit it via the “Post Yours” link above and join in the stand against Disenrollment. You’re welcome to share your name, Tribal affiliation, testimony, or other stories. Alternately, you can email your picture and caption to: stopdisenrollment@gmail.com, and we can post it for you. 3. Share. 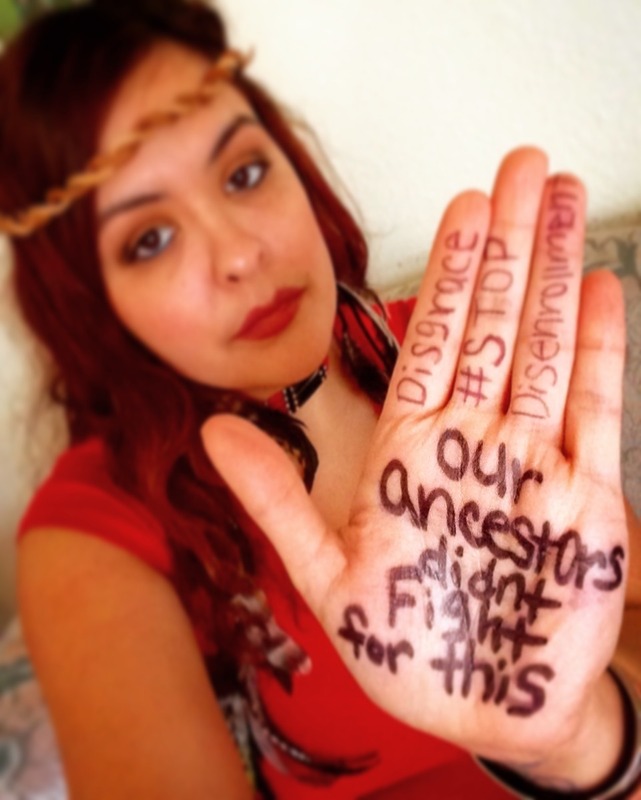 Post images and stories on other social media outlets with the hashtag #StopDisenrollment. You can also share directly from this site.